You've been framed! This powerful image shows just how effective the use of props can be on your big day. 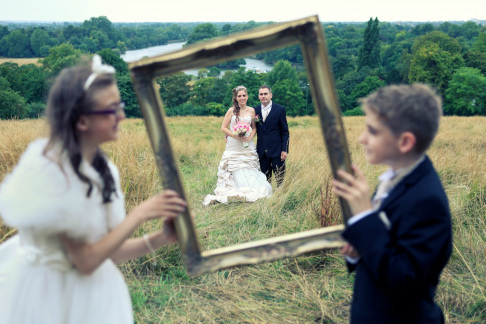 In this instance, just a simple vintage picture frame completely transforms the 'formal portrait' session to stunning effect. To achieve this, we advised the bride beforehand to bring quirky objects with her on the day that were personal to her. They not only make the photo unique & different but also inject a sense of fun into the proceedings. This heightened level of creativity is what we strive for - to give you that something a little bit different which will make your big day more memorable. To achieve the shot above, we put the focus on the couple in the frame, intentionally blurring out the flower-girl and page-boy in the foreground to create a frame within a frame. By doing this your eye is directed to the happy couple but also tells a wider story at the same time. The final effect is a distinctive image that's both contemporary and original and yet also retains a timeless quality. This is what it looks like when doves fly. 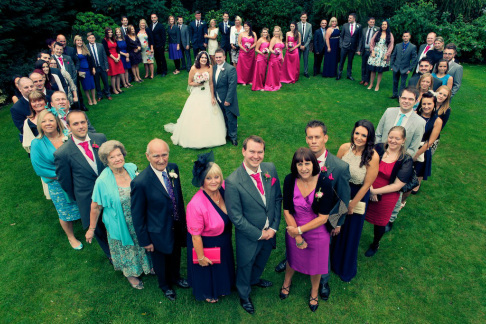 A recent photo from a summer wedding. 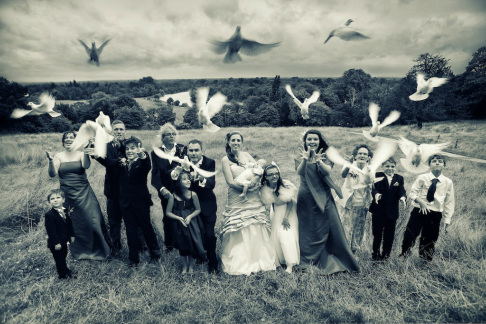 The bride chose to release white doves over picturesque Richmond - and I was privileged to be there to capture it. Suffice to say I only had one shot at this one! I thought i would share it with you because the results are absolutely stunning. In fact, so happy with the image, i've given it a name; to paraphrase popstar Prince "this is what it looks like when doves fly". If you like it please feel free to leave a comment below, thanks. Dum-dum-dee-dah... Now you can have a front row seat to see the brand new catwalk show from the North London Wedding Show. This stunning fashion show is produced by 'The Boutique' and took place on Sunday 23rd March 2014. Filmed and edited in full HD - High Definition - by the team here at 3A photography. Grab your seat, strike a pose & enjoy the show! The stuff of fairytales: a real-life Cinderella. 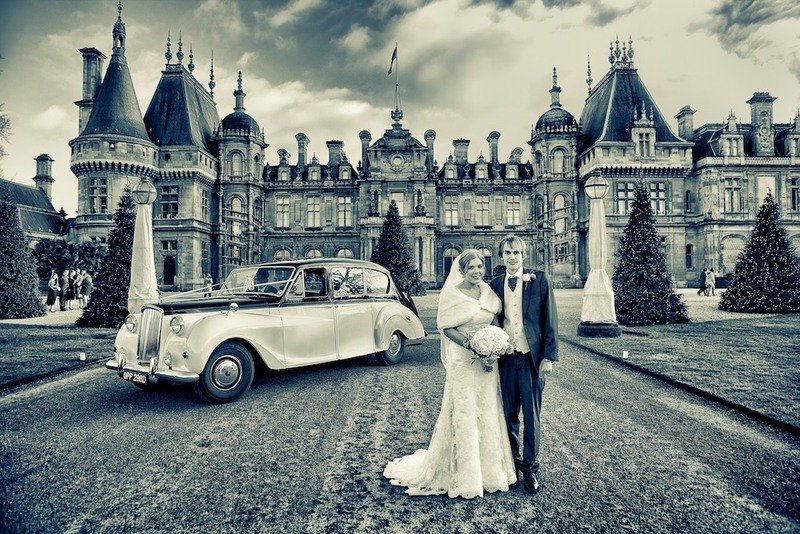 Waddesdon Manor provides the magical setting for this stunning image. We chose this setting for the formal portraits because it gives a backdrop that looks so picturesque it almost looks unreal. To add to the sense of hyper-reality we processed the image with a high contrast black & white special effect then added a colour filter to give it the timeless feel of an illustration. One challenge we faced on the day was that Waddesdon Manor is open to the public. As you can imagine, being a saturday afternoon it was heaving with members of the public (if you look closely you can see some people in the background). As luck would have it we managed to find a brief moment of calmness when we could take this definitive shot. Everything seemed to come together for us on the day; the classic wedding car covered the busy entrance of the manor while the weather was kind to us - even though it was a winter wedding and bitterly cold you wouldn't believe it by looking at the photo. In fact, it was so cold the bride got back in the car soon after this shot and felt it was too cold to carry on; so we got the shot we needed in a very limited time window. The couple are thrilled with the image and feel it perfectly sums up a magical day - a memorable way to begin their life together. Another stunning image from this summer's weddings. In this case the couple wanted a 'group' shot with a twist - so we decided on this charming alternative to create the captivating image above. To achieve the shot, we orchestrated the bridal party to stand in the shape of giant heart, with the couple in their rightful place, right at the heart of it all. I got up as high as possible using a dangerously tall (and ridiculously shakey) ladder - but regardless of the risks involved I'm sure you'll agree the shot was worth it. I know it's a cliché; they say 'a picture tells a thousand words' but this one really does speak for itself. It tells a particularly powerful and poignant story because it is so astoundingly appropriate on your wedding day. The couple tell me they love the image (or should i say they 'heart' it - groan!) and say they will cherish it for many years to come. So I guess, to quote the timelessly romantic lyrics from the movie Titanic, my heart will go on. If you like this image feel free to 'like' it below. Thanks for reading folks! 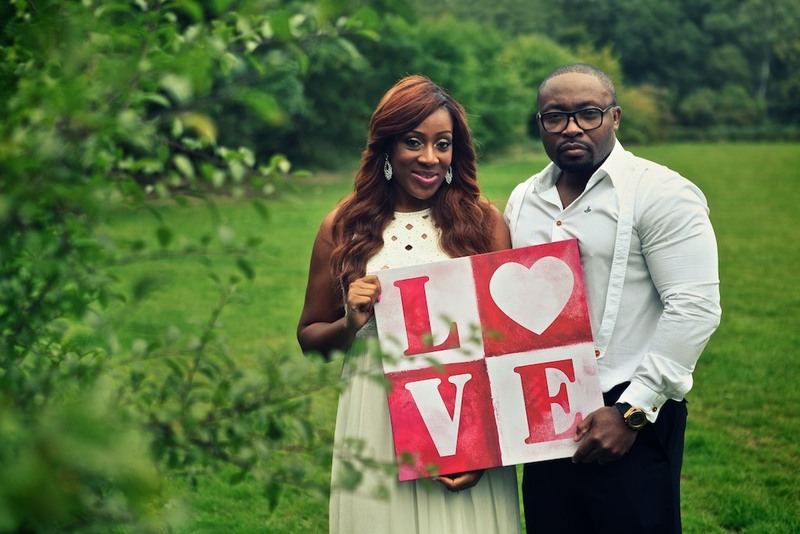 All you need is love... so for this engagement shoot we decided to quite literally spell it out. By doing this, there is no mistaking how much in love this adoring couple really are. The seemingly simple addition of the giant red 'love' canvas contrasts, to great effect, with the vibrant greenery that engulfs them. (Note here how I resisted saying 'love is all around' them.) We boosted the colours to create a retro style - coupled with understated elegance. Welcome to the brand new 3A photography blog where you will see all the latest images, get the scoop on the newest celebrities we might be snapping while out and about - and of course we'll keep you informed on all the juicy gossip! As featured in The Mail Online - the UK"s biggest online newspaper with over 33 million monthly readers. Official photographer for the prestigious national wedding competition 2012.